Chelsea & William’s (Billy) wedding took place at the elegant St. Bernards Church in Mt. Lebanon & Crowne Plaza Pittsburgh South Hotel. The first time I spoke with Chelsea was over the phone and I immediately knew we could be close friends. I would eventually meet up with her in person and as I predicted, Chelsea was someone I could relate to and someone I was really excited to work with. Chelsea is an amazing person. She sincerely cares so much for the people around her, and genuinely wants to make others happy. During the planning process, she would occasionally call me for referrals, and when we got to talking, her great spirit would just sparkle through the phone. I remember being so excited to meet her fiance Billy. The first time I met Billy was at their engagement session back in early spring. I could automatically tell how much Chelsea meant to him in the first 5 minutes of meeting him. Billy was a real gentlemen with Chelsea, and I could tell that he would do anything for her. You could check out their engagement session here. Over the course of the year, I spoke with Chelsea numerous times. It means so much to be able to help a Bride feel confident in their decisions and be helpful in more ways than just photography. Plus, it is always great hearing about all the wedding details. This always gets me super excited about the upcoming wedding day. Before you knew it, their wedding day was here. I arrived at the hotel, and I could hear the bridesmaid’s giggles once I stepped off the elevator. The girls were in the Crowne Plaza‘s preparation suite which is beautifully styled. When I entered the hotel room, Chelsea was in the middle of her hair & makeup styling from Bongiorno Bella. I got to meet her wonderful squad; including her Maid of Honor Ashley, Bridesmaids Chelsea, Holly, Nikki, Amanda & Melinda, with other VIPS such as her mom Genevieve. They were all getting ready and excited for Chelsea’s big day. I started photographing her details why my 2nd Jamie took photos of the girls. I wanted to make sure I got the detail shots that were very important to Chelsea including a closeup shot of Billy’s wedding ring. Inside the ring was a personal, inside catchphrase between Chelsea & Billy , “Your Meatball” with their wedding date 10-12-2018. I LOVE personalized touches such as this! Soon enough it was time to get Chelsea into her dress. 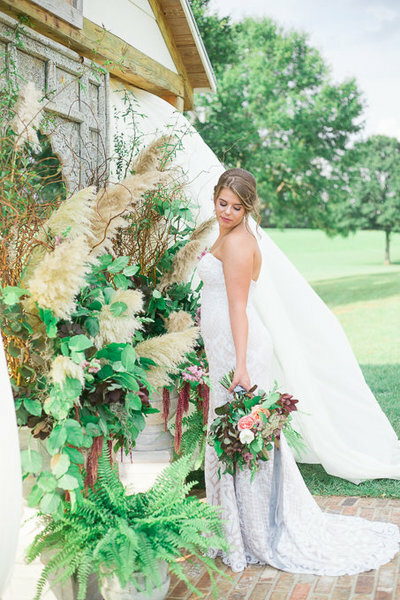 Her MOH, Ashley, and mother, Genevieve, helped her into this gorgeous gown from Alfred Angelo Bridal. Although Alfred Angelo is no longer open for retail, I feel Chelsea had found her perfect dress in time. This dress was made for her. The gorgeous lace with its breathtaking silhouette, was just impeccable. 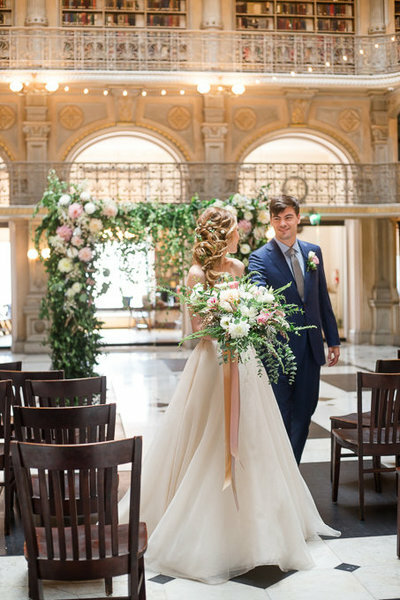 With shoes from Badgley Mischka and an incredible cathedral length veil, she looked stunning. I was so eager to see Billy’s reaction later on that day!! After she was officially dressed, we had her father come and see her before anyone else. Her father, Jerry, walked into the room and immediately was awestruck. He stood back to admire Chelsea and then went to give her a big hug. The look on Chelsea’s face told me this moment meant so much to her. After her father’s approval, it was time for the rest of her bridesmaids to get a peek at Chelsea’s bridal look. One by one, when they came into the room, they were all in awe. We decided to take some shots of the Chelsea and her bridesmaids in the morning and this was one of my favorite portions of the day. Chelsea and her girls looked stunning. The bridesmaids were rocking beautiful, champagne color chiffon gowns; perfect next to Chelsea’s ivory lace. Taking pictures of all the girls together, I noticed that Chelsea had picked a great support team for her big day. 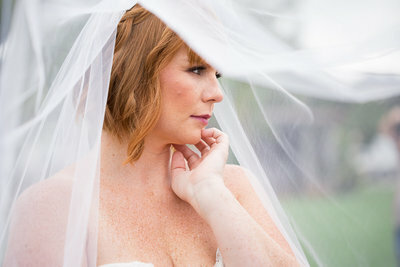 Taking some bridal shots of Chelsea, her bridesmaids were behind me filling her with confidence as they all admired her. Before the ceremony, we met up with Billy & his groomsmen to get a few group-shots. Billy had a crew of his own, including his Best Man & Brother Paul, Groomsmen Abba, Michael, Tony, Dustin, and Josh. Billy was looking very sharp in his tux from Mens Wearhouse. I could tell Billy had been a bit anxious for the upcoming events, but his crew put him right at ease. After all the jokes, I knew these boys were going to make the reception fun later on. Just when I started to have fun posing these gentlemen, I looked down at my watch and it was time for them to get ready for the ceremony. St. Bernards Church is simply an exquisite place of worship located in the heart of Mt. Lebanon, and was a divine church to hold Billy & Chelsea’s vows. The grand structure made an amazing backdrop for their wedding day. The girls walked down the aisle one by one, meeting the gentlemen halfway. All the guests anticipated Chelsea coming down the aisle, including Billy who waited patiently at the end of the path. As MOH Ashley reached the end to meet Best Man Paul, Billy was gleaming with anticipation. Then at the top of the St. Bernard aisle, stood Chelsea, next to her dad, Jerry. Billy started to tear up the closer Chelsea got to him. We got most of the bridal party pictures outside on the church’s light and airy grounds. We got fun group shots as well as some bridesmaids shots with their bouquets. 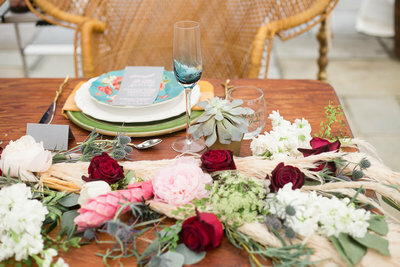 The splendid florals were from Pete Donati & Sons. 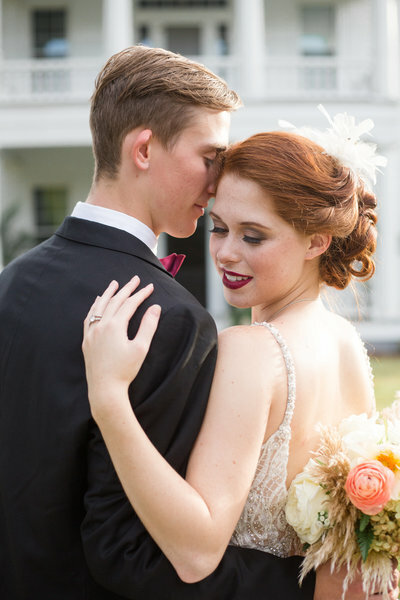 Chelsea’s bouquet was a ravishing ivory dream and became one of my favorite bouquets of the year. 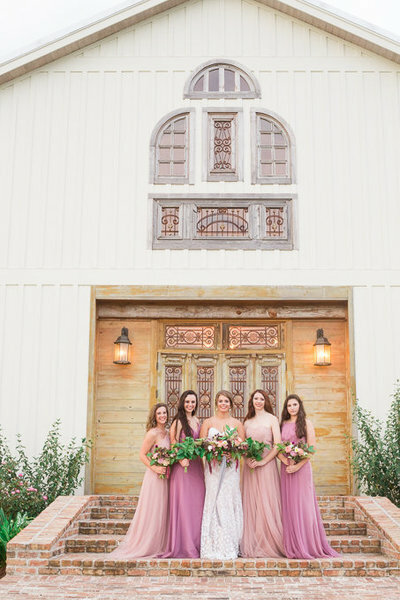 The bridesmaid bouquets were pink with hints of blue and red which looked fabulous against the champagne colored dresses. Chelsea really wanted to get some photos with fall foliage but this year was a rough year for foliage. The trees didn’t seem to show color until closer to the beginning of November and the nearest turned trees were just too far from the hotel. But because I was determined for Chelsea to have something with color, I made sure to find some colorful trees around the hotel to use as a backdrop. I ended up loving these photos because we had a pleasing sky behind them as sunset set. Back at the Crowne Plaza, we all started to get ready for their introductions. As the bridal party got ready to party, I really got a chance to fully appreciate the ballroom and the decor. Chelsea had all her tables with a beautiful champagne colored table clothes, with accented stylish gold, modern chairs. Each table had bouquet centerpieces that had white hydrangeas with pink roses and red accents. The walls filled the space with purple uplighting. The long head table had a ruched, lighted tablecloth, that sat behind the cake table. 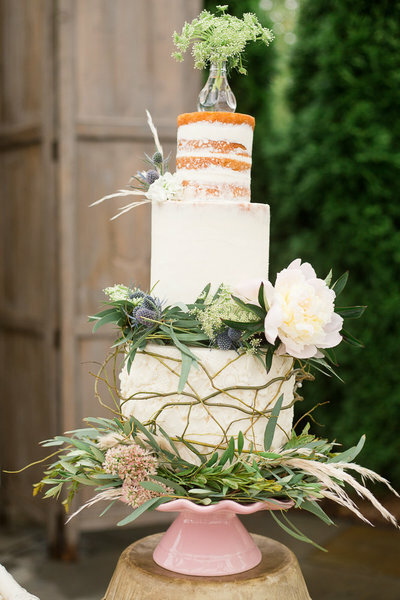 The cake from Signature Desserts was ivory with delicate gold accent leaves. On the side of the cake, a waterfall of white and pink flowers draped the cake. On top, a personalized gold cake topper with their initials. As we all settled down to listen to the welcoming speeches, MOH Ashley started us off. Ashley spoke wonderful words about meeting Chelsea at Carlow and them being inseparable ever since. She told everyone about Chelsea being asked out by this guy and Chelsea not wanting to go. Ashley said “Ill never forget telling her, Just go!!! You may never know that this is the guy you are going to marry!! Well six and a half years later, here we are Chels!! Its your wedding day… to the guy you didnt want to go out with!!!”. The whole ballroom giggled! Ashley started tearing up talking about how wonderful Chelsea truly is and how she has been there for her through rough times. You could really tell how wonderful of a friendship these two share. Often on wedding days, I have favorite parts of the day. For me, this day, my favorite part was Chelsea & Billy’s first dance. The first dance song was an angelic cover of “Im Gonna Be ” (500 miles) by Sleeping At Last. It gave such a new perspective to the classic song when you listen to the lyrics. I would encourage anyone to listen to it. Its now on my wedding playlist. But when I first heard it as Chelsea & Billy danced to it. I was in tears. What a dazzling representation of their love. That they would do anything for each other, even walk 500 miles. Chelsea was emotional holding onto Billy and I cried even more when she rested her head on his chest. After the first dance, they continued into the parent dances. Chelsea had a wonderful dance with her father, Jerry, and Billy with his mother, Susan. Then the real party started. All the bridal party started dancing, and guests followed. Overall, it was a great day watching these two lovebirds up close. As a photographer, you can grow so much love and respect for your clients that you don’t want the night to end. Chelsea & Billy are the type of clients that you want to be friends with, and I couldn’t begin to explain how incredible they are. Thank you so much for letting me witness your love in person. I hope you can look back at your day and say it went better than you dreamed. From the engagement session, I learned that you two would do anything for each other and what a wonderful foundation to bring into your marriage. I sincerely wish so much love and happiness for the days to come.